In New England we like to enjoy the summer months from our decks and patios. Atlantic Coast Property Solutions provides a variety of residential deck and patio building services. Whether your current deck is breaking down and you need a major upgrade or if you have a space of land that you want to explore, we can address your needs. Outdoor decks can truly transform a home. Decks can create an outdoor room to relax, host gatherings, and enjoy the outdoors. Let’s work together to create or refine your ideal outdoor space. 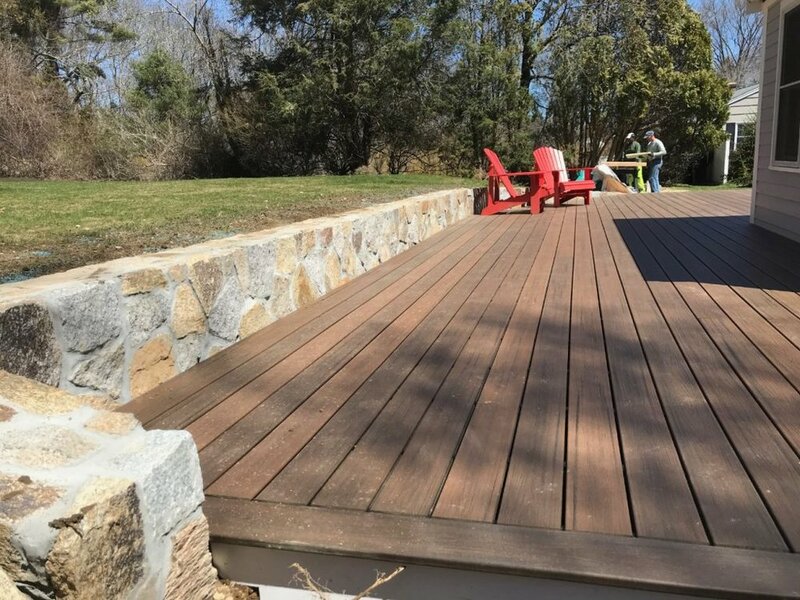 Composite decks have made great strides in the past decade, taking wood impression decking, and making it the most sought-after product in the decking industry. Not only is it made from all recyclable materials, it is also scratch resistant and almost maintenance-free. 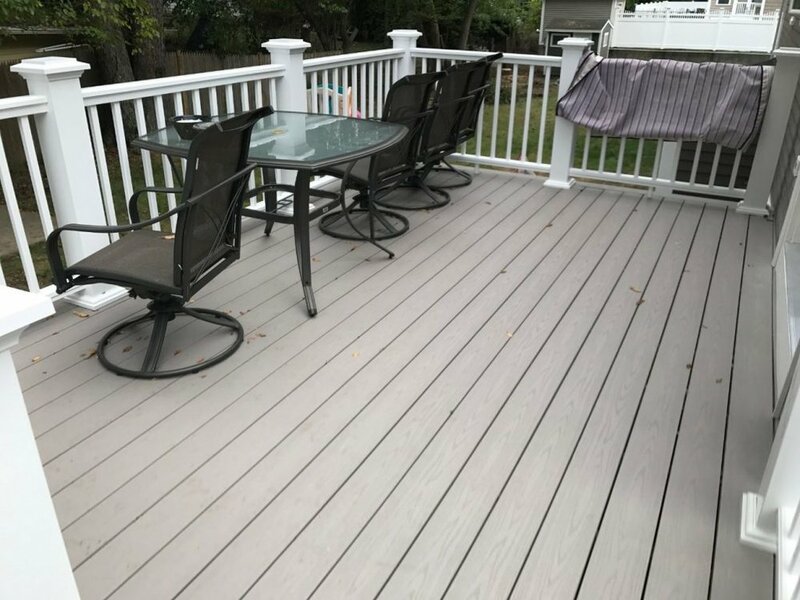 It is a mold resistant solution that is durable against New England’s ever-changing weather and will make a great addition to your newly installed deck or patio. While wood decks tend to warp and splinter, composite decking like Trex and Azek are resistant to normal wear and tear and insect and UV-proof. That means no fading, staining, or termites! Maximizing outdoor space for entertaining can be accomplished a variety of ways. At Atlantic Coast Property Solutions, we often install paver patios across the Greater Boston Area and South Shore of Massachusetts to help homeowners expand their outdoor living space. When you work with us, you’ll receive excellent service and welll-executed projects done the right way. Paver patios have many benefits to a homeowner and is often a companion solution with a deck. They are affordable, durable, and easy to repair. They also add to the aesthetics and are very low maintenance. Our team of paver patio contractors will work with you to make the vision for your outdoor space come to life. There are so many different materials, styles, and layouts available and we can help you narrow down your options and to execute on your plan. Whether it be off your back door, around your pool, around a fire pit or anything else, we can help you out. Covered in weeds, moss, and algae? 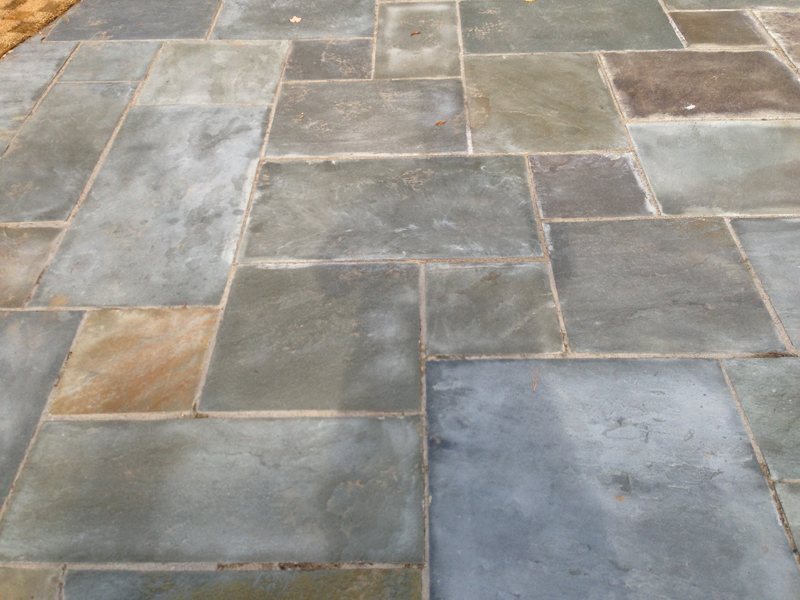 You can solve your outdoor stone problems with one product: polymeric sand. Though still a relatively new product, polymeric sand has become the gold standard in blue, paver, and brick patio restoration. When you have your patio restored using polymeric sand, you protect your investment and extend the life of your stonework. The result is a patio that looks brand-new. See more of our work here. Atlantic Coast Property Solutions is one of the only companies on the South Shore to specialize in patio restoration using polymeric sand. Our process will have your paver deck, pool patio, walkway or driveway leveled, protected and returned to original condition in days. Cleaning: First, we’ll perform a thorough cleaning of all the hardscape surfaces and joints. This cleaning includes the application of our stone color revitalizer followed by a stain and rust removal application to any areas that need it. After a thorough cleaning, the surfaces and joints receive a hot water rinse in preparation for polymeric sand installation. Polymeric Sand Installation: After drying, we fill the joints with a high quality, antibacterial, polymeric jointing sand. The residue is blown off, broom cleaned, and then thoroughly wetted in order to activate the stabilization process. Polymeric sand is a significant upgrade to stone dust joint filler that was commonly used before the creation of polymeric sand in 2008. Sealant Application: Once the surface has dried after the poly sand installation, we’ll prepare the hardscape surfaces for the application of a high quality, weather protective sealant. In sections, the surfaces are thoroughly blown off and broom cleaned to remove any residual debris. Next, the sealant is applied generously and evenly to create a protective barrier from rain, snow, heat, or anything else Massachusetts weather can throw at it. The sealant application is designed to maintain the beauty that our cleaning and joint sand install process will achieve for many years to come. Complete: Your newly restored patio will last approximately 5-7 years, sometimes more depending on the weather conditions.